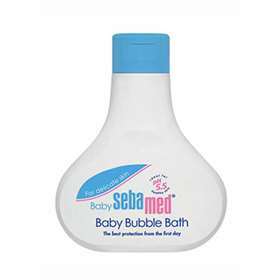 Sebamed Baby Bubble Bath 200ml is 100% soap and alkali free for the gentle cleansing of baby's delicate skin. Sebamed Baby bubble Bath with it's pH value of 5.5 supports the moisture balance of baby's skin and the development of the skins biologically protective acid mantle, which is consolidated in the first months after birth. The extra mild wash's active complex cleanses an infants skin gently and safeguards it from dryness caused by cleansing. The herbal extract of the medicinal plant chamomile known for its regenerative properties soothes the skin and protects the skin against irritation. Natural moisturising agents protect against dryness. Put a couple of drops into the baby bath. Add warm water to create some foam. Wash your baby gently with caressing strokes. This is a no tears formula, however it is important to avoid contact with the eyes and rinse with a lot of clear water should this happen. Aqua, Laureth-6 Carboxylic Acid, Cocamidopropyl Betaine, Disodium Cocoamphodiacetate, Sodium C14-16 Olefin Sulfonate, Polysorbate 20, Laureth-2, Chamomilla Recutita Flower Extract, Sodium Lactate, PEG-150 Distearate, Alcohol, Parfum, Sodium Benzoate, Phenoxyethanol.